Average trading volumes this year are down more than 50 percent from their 5-year mean, worse than those in Europe and the U.S., and a world away from China, which is running about 60 percent above average, according to data compiled by Bloomberg. Foreign investors have made net sales of more than $17 billion of Japanese equities through April 10, according to EPFR data compiled by Jefferies. Japan’s Topix Index was little changed Tuesday after hitting a December high as the first round of trade talks with the U.S. continues in Washington. Stocks across the Asia Pacific region were mixed, while U.S. equity futures inched higher. 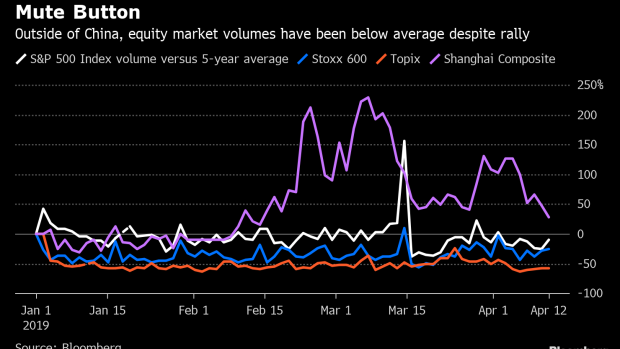 For Japan, a near 9 percent rise in the Topix this year still lags many of its Asian peers, underscoring just how difficult it remains to build a bull case for equities in a country facing long-term growth and demographic headwinds. While U.S. companies have spent the past 10 years increasing leverage on their balance sheets, Japanese counterparts have been doing the opposite. Japanese profits have also been strong, further bolstering balance sheets. Valuations are also attractive, with forward earnings yields showing not only are there plenty of cheap stocks but also a much wider range of them. By contrast U.S. shares are not only looking increasingly expensive, but are also clustered around a more expensive mean. Meanwhile, one of Japan’s biggest investors in both stocks and bonds looks likely to continue its stimulus program. It’s vital for the Bank of Japan to continue persistently with powerful monetary easing, Governor Haruhiko Kuroda said in response to questions in parliament Tuesday. The BOJ’s purchases of equity ETFs are to help achieve price stability, he said. The central bank expects Japan’s economy to continue its moderate expansion as the global economy picks up in the second half of the year, and will also be watching how Japan’s falling population weighs on regional banks’ profitability. Speaking of aging, it remains one of the biggest overhangs for Japan’s economy and markets, and the debate over pension reform is likely to return soon, according to Robert Feldman, senior advisor at Morgan Stanley MUFG Securities, in an April 15 note. He suggests raising the standard retirement age in Japan to 76 in 2040, which would lower the ratio of government pension payments to GDP to about 6 percent from current levels of almost 11 percent. If the retirement age was left at 65, that ratio would range from 9.5 to 12.25 percent, depending on productivity growth.